On the day of the TouchPad firesale, I took it upon myself to spend what little remaining balance I had from graduation and buy my first tablet. After a delay from BestBuy, it has finally arrived in perfect working order. I wish the HP Computer boxes looked this good. Clean, simple and very clear on what's inside. 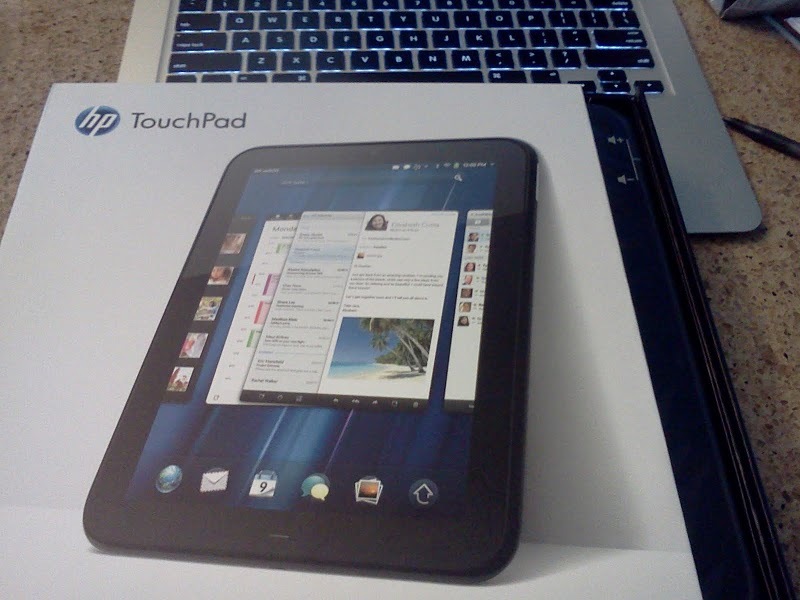 These are initial thoughts from my first experience with the $99 HP TouchPad. I haven’t used it long – a few days at most has it sat in my house on my kitchen counter, and maybe just over five hours of total hands on time. That’s constitutes my basis. My first thought as I opened the shipping box: it looks like the MacBook Air’s box. It has a picture of the TouchPad on the front and for the most part, everything else is white except for its name on the sides and a little bit of crediting information on the lower back side. A truly shameful moment caught me next. I could not grasp how to open the TouchPad box without damaging it. The MacBook’s box was easy to open, simply hold the cover and let the weight of the bottom section slide the bottom-box out. Easy. But the TouchPad was different, it had a side-loaded box. I was not sure if I needed to pull a tab away to let it loose, or some other mystical and innovate method open it. After an embarrassing four minutes, I pulled the side out revealing the TouchPad. The TouchPad’s compartment was clean: a side-box for cables and a main portion delegated to the goods: the hardware itself. It was wrapped in a plastic sheet for protection and that was luckily easy enough to peel off. After locating the power button the top of the TouchPad, a little HP logo appeared on the screen. It was generously about the size of a nickel and did nothing apparent for about two minutes but it started to pulsate and glow eventually. For another three minutes I waited for something. I ended up on a language selection screen, then a country selection screen and finally a confirmation prompt. The TouchPad then launched me into a Wifi-setup dialog. This Wifi dialog was honestly frustrating and I am rarely frustrated with these kinds of things. I am sure it was obvious mistake I made, but I waiting for ages to get it to work. The TouchPad discovered my Wifi network easily. I tapped it and another dialog appeared entitled “Join Integral” with a text box under it. I assumed it was for the password, but a little indication would’ve been nice. 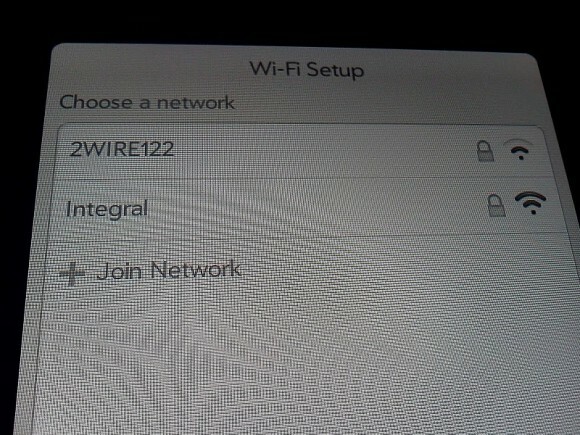 After entering the network password, I would continue but the Wifi-setup dialog would simply come back. I went through this about ten times before it finally registered. Finally connected, the TouchPad asked me to agree once, agree twice and make an account for WebOS. Then some more mystery setup time was taken from my life followed by the first “The device will restart…” I have ever seen on a mobile device. 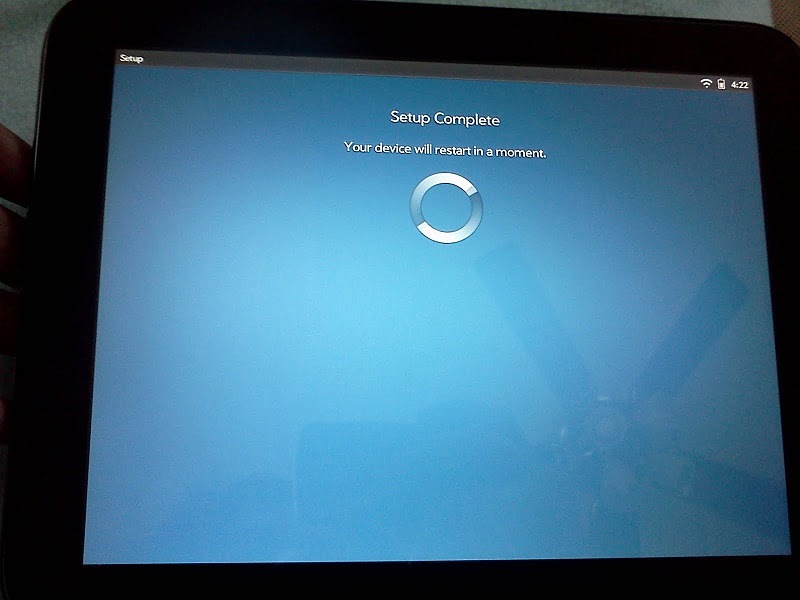 The TouchPad has to restart after setup, so what is this? An OS from 1999? Windows? What's going here? Once I was through all of the setup nonsense, I was at the home screen of nothing. I was not entirely sure what the next step was, so I did what I always do when I am out and see a tablet: I go to my business card homepage. Any store with a device with a browser, I leave my homepage up when I leave - it's only fair, I'm testing it, after all. And that was my first experience with the HP TouchPad. It was pretty fast, except for all that setup-waiting I had to do, and it was pretty in a sense that it looked ascetically pleasing. You can see my full gallery of unboxing and setup pictures and egerily await more thoughts on the HP TouchPad, coming soon. Thanks goes out to Ian Buck for commenting on the poor editing in this post. That’s what I get for publishing too soon. If anyone wants to be my editor, I’d absolutely love it. One thousand posts later. That is a tiny marker of success. It is one of many I see on my dashboard to indicate I am here, alive and occasionally active. Writing is hard, anyone who writes frequently understands this. Every year when there is a major update, I like to write a little message here for those dedicated to reading incoherent rambling but also to myself — because I know I will read it again in the future. Everything takes time and I spent nearly five years cultivating this plot on the Internet. Thanks for joining me. I like the message I wrote last year, last update, so I’ll sign off again with that. Please enjoy the future with me. A little less than a week after I released the refreshed blog, I wind up back here at post zero. Post zero for every WordPress blog is Hello World and even I did not offer exception to that. Funny, I intended to wipe the slate clean of the first years of my paltry writing but instead I am choosing to rewrite decent to make it better and to leave the bad to remind me of how things were. While having a new modern clean version of WordPress would have been great, this will do fine — instead of making a compromise in having Archives here and Tomes there, I settle for keeping everything in a single continuous chronicle. Every so often, my life comes with a theme. A few come through my memory still, in high school, there were Absolute, Transparent Ambiguity and Intangible Tangerine. At this part of my life, for some reason, I fell upon the theme of Mirai. Please enjoy the future with me. 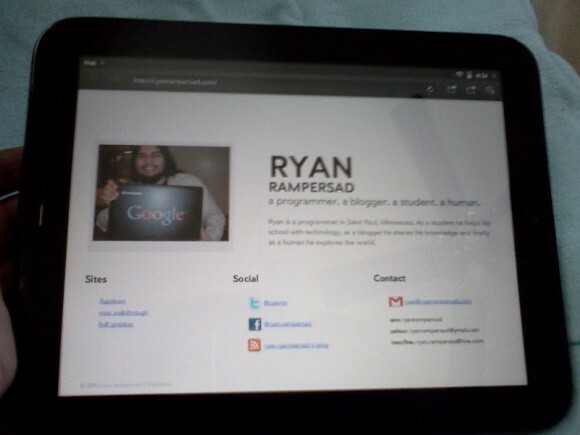 A couple weeks ago, I migrated this blog from it’s original home at ryan.ifupdown.com to its new location at blog.ryanramperasd.com. Today, I deployed the next stage of a series of updates to the blog: a new theme. My first theme was from Chris Pirillo called WiketPixie. It was nice but it just wasn’t for me. I switched to the hybrid theme and eventually hybrid original. I updated hybrid original a little bit too but there is only so much I could do. Two weeks ago I started working on this new theme. I throw away the dark background and keep my content bright. It’s sans-serif and clean. Simple. It’s a new chapter for the blog. Thanks, once again, for reading. Have a good one. After slightly more than a year of blogging, I’m still here. It is pretty amazing that I’ve lasted so long but a lot of great people have left comments and the blog has grown from the first post, this one, to 101 posts on November 29th, 2008 to today. I’m counting around 212 posts and that is a marvelous achievement in my eyes. I hope that if you’re reading my very first post, you have found my blog interesting and useful. I’ve grown too of course, a few days from now, I start my junior year in high school. Thanks again for reading!